Wrongful Death Ft. Lauderdale | Welcome to Adam Franzen. P.A. Did you know that the state of Florida has the highest number of deaths from bicycle accidents of any state in the nation? It’s true, bicycle deaths occur at a rate of 0.57 per 100,000 people, more than double the nationwide rate of 0.23 per 100,000. And to compound this dismal news, Florida has barely made any progress on reducing the number of bicycle deaths—less than 10 percent. Only Wyoming had a poorer showing over the last three decades, compared to all other states. According to a CDC report titled “Bicyclist Deaths Associated with Motor Vehicle Traffic — United States, 1975–2012”, bicyclists die on U.S. roads at a rate double that of vehicle occupants, even though bicycle travel accounts for only about 1 percent of trips across all modes of transportation. Bicyclists in Florida take a risk in the nation’s worst state for traveling by bike. Year after year, Florida is among the top states in bicycle fatalities. But it is not keeping bicyclists off the roads; quite the opposite. The number of bicyclists continues to grow. MYTH: Most bicycle crashes in Florida involve bicycles that ran stop signs or red lights or failed to stay in lanes. The fact is that most are caused by the inattentiveness of drivers of other vehicles.Cyclists have as much right to the road as other vehicles. They are required to obey the same traffic laws as other motorists. MYTH: The majority of motorcycle crashes involve seniors (snowbirds)who are driving on Florida roads during the cooler months when there are also more cyclists on the road. The fact is that drivers age 20-24 account for the highest percentage of crashes. The next highest percentage is from the age group between 45 and 49. This percentage drops significantly for drivers over 55 — lower than any younger age group. FACT: The counties with the highest populations have the greatest number of crashes and fatalities. The top three in order are Miami-Dade, Broward and Hillsborough. There are also a number of hotspots in Southwestern Florida in Cape Coral, East Naples, Immokalee and Ft. Myers according to a recent study by the News Press. Of course, an accident between a bicycle and motor vehicle will always be more devastating for the bicyclist. Even a minor incident, like a bicycle running into an open car door, can cause serious injuries. Wearing a helmet may reduce the severity but it is not an absolute preventative measure; there is still a chance of traumatic brain injury. Other injuries include spinal injuries, fractured bones, internal injuries and severe abrasions and contusions—even death. 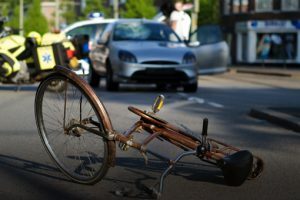 Bicycle deaths or other wrongful deaths can be devasting to the survivors! Attorney Adam Franzen can help you get the justice you deserve if your loved ones have died due to the neglect of others. He knows the Florida laws on wrongful death and can represent you in your claim. Call Mr. Franzen at (954) 462-5790, or visit his website to learn more about how he can help you with your wrongful death or personal injury cases. This entry was posted on Thursday, August 4th, 2016 at 5:22 am	and is filed under Blog. You can follow any responses to this entry through the RSS 2.0 feed. Both comments and pings are currently closed.